Looking for a Used S8 in your area? CarGurus has 111 nationwide S8 listings starting at $9,990. The Audi S8 sedan, a key member of the automaker's flagship A8/S8 lineup of vehicles, remains essentially unchanged for 2014, receiving only a Side Assist blind-spot alert system as a new standard feature. Available in a single 4.0T Quattro trim on the standard 117.8-inch wheelbase, as opposed to the longer 122.9-inch wheelbase available to the A8 and the upper-level W12, the S8 combines the best elements of a performance-oriented sports car and a top-of-the-line luxury sedan and competes at the highest levels in both categories. Its twin-turbo V8 engine, which it shares with the Audi S6 and S7, pumps out 520 hp, driving the sedan from 0-60 in a staggering 3.9 seconds. The S8 rides on a highly capable sport-tuned air suspension and includes Audi's quattro all-wheel-drive (AWD) system as a standard feature. Inside, the plush cabin pampers passengers with Valcona leather upholstery, 22-way power-adjustable front seats, an MMI navigation system and a premium 14-speaker Bose audio system. But that's just the beginning. In many ways, the S8 represents the epitome of Audi's auto-making art. Outside, the S8 displays a solid, sedate look, with an aggressive front end, straight creases along the sides and a high tail. Some reviewers find the design a little too squared off, but the conservative styling certainly distinguishes the S8 from lower-end Audis and helps the luxury sport sedan establish a certain amount of gravitas. Audi uses high-strength aluminum throughout the S8's frame and body panels to ensure rigidity while keeping the weight down. The S8 still tips the scales at a hefty 4,685 pounds, but the aluminum frame and body components help to improve the S8's agility and contribute to that 3.9-second 0-60 time. Beyond the same basic lines, a number of features distinguish the S8 from the A8, upon which it's based. While the A8 gets HID headlights with LED daytime running lights, the S8 upgrades to full LED headlights. The A8 shows off dual exhaust pipes, while the S8 adds two more for sporty quad pipes. Other differences appear at the front and rear, as the S8 receives a unique Silverframe grille with chrome horizontal twin slats over a platinum background, as well as lower front air intakes, larger rocker sills, black brake calipers and aluminum-alloy power folding side mirrors with heating and auto-dimming functions. Other standard exterior features on the S8 include a headlight washing system, heated windshield wiper nozzles, power soft-closing doors, LED taillights and rear foglights. In addition, a high-beam assistant turns the high beams on and off automatically, depending on traffic and current lighting conditions. Under the hood, a 4.0-liter TFSI twin-turbocharged V8 continues to power the S8. While the same engine in the S6 and S7 produces 420 hp, Audi tweaks its electronics for use in the S8, boosting output to 520 hp and 481 lb-ft of torque. The V8 mates to an 8-speed Tiptronic automatic transmission with a manual-shift mode and steering-wheel-mounted paddle shifters with an aluminum finish. Audi's cylinder-on-demand technology, which comes standard, shuts off 4 of the 8 cylinders at low speeds or when idling, reducing fuel consumption by up to 10 percent, according to the automaker. Despite its high output, the S8's engine still manages relatively decent fuel economy numbers of 15 mpg city/26 highway. Audi limits the S8's top speed to 155 mph, and premium fuel is required. With all that horsepower, few sports cars, let alone luxury sedans, can keep up with the S8 as it makes the jaunt to 60 mph. The Porsche Panamera manages to run neck-and-neck with the S8, also making the run in 3.9 seconds. The upcoming Jaguar XJR will take 4.4 seconds to cover the same distance, while the similarly equipped Jaguar XJ AWD takes 6.1 seconds. Meanwhile, the BMW 750Li with the automaker's xDrive AWD system takes 4.6 seconds for the journey. There are certainly cars that are faster than the S8, and some that are more luxurious, but few offer the S8's winning combination of supreme power and high-end luxury. The S8 sits on an S-specific air suspension, which lowers the vehicle at higher speeds to help conserve fuel. Like many of Audi's high-end vehicles, the S8 features a 5-link suspension with a stabilizer bar in the front and a trapezoidal-link rear setup with S sport calibration. Audi's quattro AWD system provides a rear bias, splitting power 40/60 front-to-rear under normal driving conditions. When required, the system sends power to the wheels with the best grip to improve stability. Owners can add an optional rear sport differential with torque vectoring, which sends varying amounts of power to individual wheels for superior cornering in turns and when accelerating. Using the standard Drive Select system, drivers can adjust the firmness of the S8's ride by choosing from Comfort, Dynamic, Auto and Individual settings. Overall, reviewers agree the S8's suspension provides a firm ride that never seems jarring or harsh. Big 21-inch 5-triple-spoke wheels with summer performance tires help smooth out rough road surfaces, and Audi offers a number of other 21-inch wheels with different designs, including a titanium finish. Like all cars in the A8/S8 lineup, the S8 comes equipped with a hydraulic speed-sensitive rack-and-pinion steering system, which provides good precision and feedback, making it relatively easy to maneuver the big sedan. Inside, the S8 offers one of the best cabins available today. Well-known for its plush interiors, Audi equips the S8 with all its latest technology and luxury features. In addition to Valcona leather upholstery with diamond-shaped contrast stitching, the S8 comes equipped with heated and ventilated 22-way power-adjustable front sport seats with memory functions and 4-way power lumbar support for both the driver and passenger. The 3-spoke multifunction sport steering wheel includes a power tilt/telescopic steering column, as well as paddle shifters. Aluminum and carbon interior trim, aluminum pedals and an Alcantara headliner add a sporty touch, while 4-zone automatic climate control, a power sunroof, Audi's advanced key system and power rear and side window sunshades are also part of the standard package. High-tech features include Audi's MMI navigation system with an 8-inch color screen, dedicated buttons, handwriting recognition and AutoPilot noise compensation. The new Audi Connect feature, which also comes standard, provides in-vehicle wi-fi and localized weather and information. A 14-speaker, 630-watt Bose Surround Sound audio system, managed through the color touchscreen, includes HD radio, SiriusXM satellite radio, Bluetooth, a CD player and an iPod port. Owners can add an available 15-speaker, 1,300-watt Bang & Olufsen audio system, as well as a solar sunroof, a rear entertainment system, a heated steering wheel and a variety of wood inlays and interior trim. Eight airbags, including knee and thorax side airbags, come standard on the S8, along with electronic stability control, traction control and antilock brakes with electronic brakeforce distribution and brake assist. The new Side Assist blind-spot alert system comes bundled with the navigation system, while a standard parking system includes a rear-view camera as well as top- and corner-view cameras. Other safety features include a Pre Sense system, which helps reduce damage in rear-end collisions by tightening seatbelts and closing windows and the sunroof when it detects an impending crash. Lane assist and night-vision assist are among the safety options. 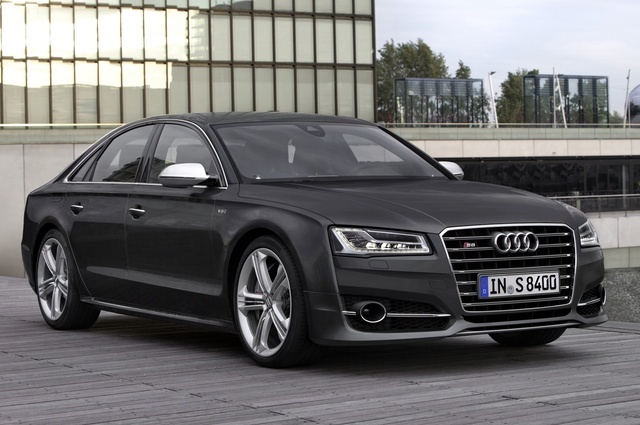 What's your take on the 2014 Audi S8? Users ranked 2014 Audi S8 against other cars which they drove/owned. Each ranking was based on 9 categories. Here is the summary of top rankings. 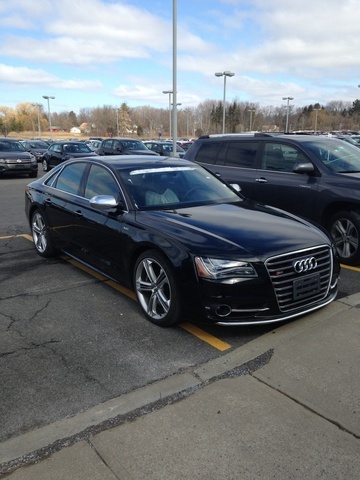 Have you driven a 2014 Audi S8?